F. Diagram: Explanatory of the surveys proposed to be executed in the order of importance to the interests of the Government, marked 1,2,3. 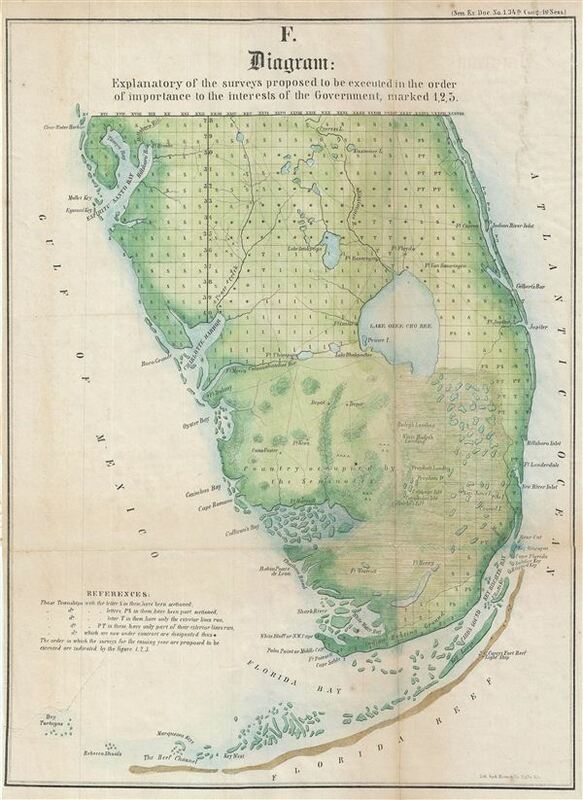 An appealing 1855 Florida Land Office survey map of the South Florida. This map covers peninsular Florida from Tampa Bay south as far as the everglades and the Florida Keys. Numerous cities, depts., lakes, and other geographical features are noted. The region between The Caloosahatehee River and Ft. Harrall (Gullivan Bay) is identified as 'Country Occupied by the Seminoles.' This map was drawn to illustrate the progress and order of the active and scheduled Florida land survey work. The state of the Land Survey is also noted via a series of blocks, mostly confined to the upper quadrants and the eastern seaboard, representing the survey grid. A table in the lower left quadrant explains the various markings on the blocks. Though lacking attribution, this map was most likely prepared by John Westcott, director of the Florida Land Office in 1855. It was engraved by A. Hoen and Company, government printers, in Baltimore, Maryland for issue in the 1856 congressional report, Maps and Views to Accompany Message and Documents 1855-56. Very good. Original fold lines. Professionally flattened and backed with archival tissue. Some wear and toning on original fold lines.